et America be America again. 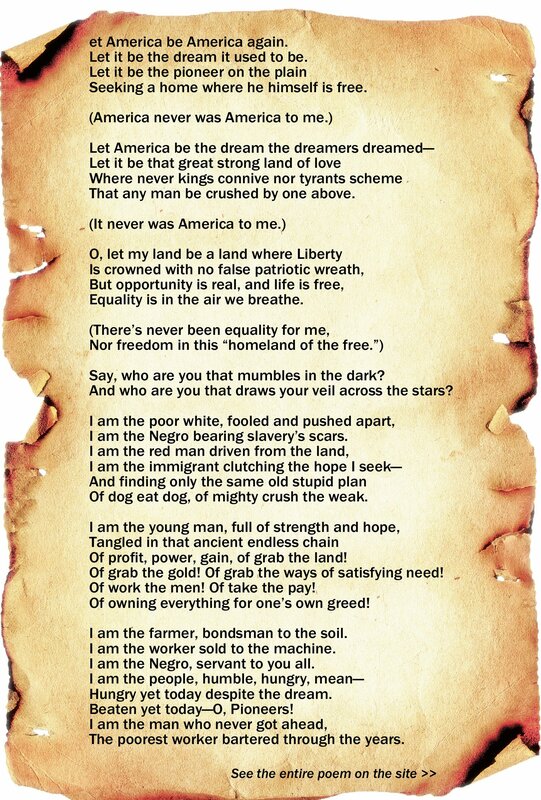 The patriotic idea embodied in the poem “Let America Be America Again” is still relevant today, almost a century after the poem was written. The American dream looks great, but reality is often not so beautiful. Can the American dream of a world of equal opportunities again become the foundation for America? The author is convinced that this is possible. Historical context is very important for this poem. 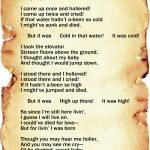 This poem was written in 1935, and this is the period of the Great Depression. The economic crisis for many Americans has become an extremely difficult test. But Langston Hughes was sure – this is also an opportunity to revive the American dream in its original form, to make this dream come true. The black author is constantly confronted with the inability to earn on his literary work. But these difficulties only strengthen the desire to achieve this goal. Finding your literary language, which would be accessible to listeners, made this poem very original. Here you can feel the influence of Walt Whitman, Paul Dunbar, as well as the rhythmic drawing of jazz compositions. A central artistic technique used by the author is interesting. This method is identification. It allows you to literally feel yourself – as part of America – and black, and white, and red, and comes from any country in the Old World, a child young and full of strength, old and frail. And it is to feel the desire for freedom by every person – and a strong deficit of this very freedom. Restoring the dream, the embodiment of this very dream of an ideal America as a land of freedom is the author’s main passion, and he suggests that everyone who has the same point of view on the question should join in the realization of this dream as himself did. The author constantly emphasizes the fact that the ideal America – the country of freedom, independence and equal opportunities – was never there. Even a constant appeal to the image of “old America”, in fact, only emphasizes the claim that this dream has not been embodied. The pioneers and all subsequent generations dreamed about it, but it still did not come true. Fake patriotism (or romantic dreams of the ideal) alternates with a kind of inner voice. Strings, underlined by brackets, seem to reinforce the duality that the author experienced. The theme, quite sharply elevated in the poem, is competition. Indeed, equality of opportunity implies free competition. However, the author emphasizes that he encounters unnatural competition. And in this caricature image the right of the strong fixes people in different links of the hierarchical chain. It requires much more serious efforts than simply free competition to free from these links, if even possible. Are egoism and greed really the same manifestations of the free man that the first settlers dreamed of? Is the reality really a dream, for which immigrants from many other countries are traveling to America today? The author rigidly ridicules this naivety, calling it only his own dream, a dream that has nothing to do with reality. This phrase sounds like a mantra, a spell. And, repeating these words, the author seems to lose hope every time – and finds it again. America here is not a real country, but an ideal world. A world where everyone is free, and freedom belongs to everyone. A world where property is the prerogative of the majority, not the minority. But the hope for change is too little strength. To transform the developed imperfect world into the ideal one needs will. And the author is convinced – this will has already begun to accumulate in order to transform the world. A dream will manifest itself in its time. The complex structure of the poem, composed of quatrains, octets, quintets, more or less complex forms, resembles a fiery speech, which turns into private reflection, then into an appeal. Surprisingly, it is this complex form that creates a unique sense of sincerity of the author. And it is this sincerity that bribes the reader, forcing him to support the idea – to transform an ordinary country into a truly ideal world.